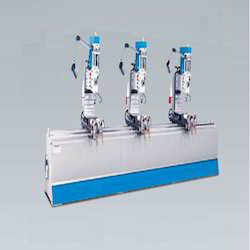 Offering you a complete choice of products which include three head drilling machine. We are engrossed in manufacturing, supplying, and trading Three Head Drilling Machine. Higher drilling speed of the machine permitted rolling bearings put back the customary displacement along the head drills. The machine is manufactured adhering to OEM and ODM standards for quality and reliability assurance. Backlash complementary cylinder is caught up as the tool post moves in the axial way, effectively reducing the space between head and screwing driller. Along with it, clients can get the machine from us at industry leading prices. Looking for Three Head Drilling Machine ?